This post is ridiculously overdue; I don't know why I haven't shared it with you sooner, but it's what we had been waiting for, for SUCH a long time and yes, it has finally happened! 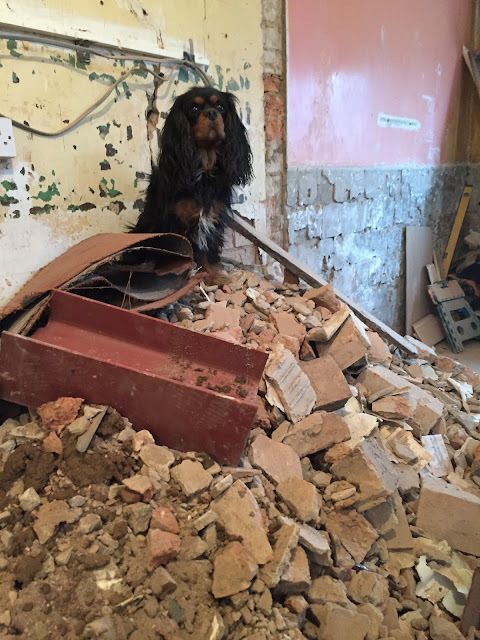 If you remember my post back in April you'll remember the woes we were having with our builder whom we had booked months in advance, but was being rubbish with contact, rubbish with keeping to our booking date (and letting us know about it!) and rubbish in providing a whole costed figure for some additional work we had requested. We decided to cancel and find a new builder with some desperate urgency for this job to go ahead, which was now weeks behind. Just a couple of weeks later I had a very unexpected phone call from our new builder Rob, saying "are you busy tomorrow? do you want your walls down?". And that was that. Here's a little reminder as to what the rooms used to look like a few months ago. 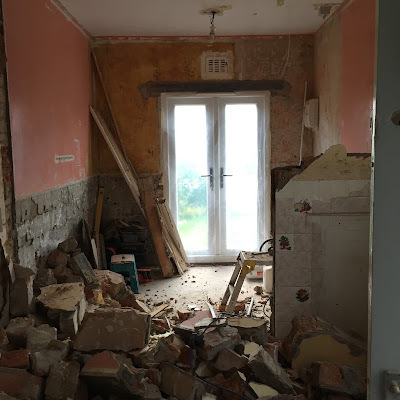 You can see both walls that are being removed in the photo above: one between the dining room and kitchen (this one is load bearing) and the other between the kitchen and old shower room (this one is providing some support to the extension roof). The built-in cupboard on the left of the door will also be removed too. We paid our local building control back in January (seriously!) 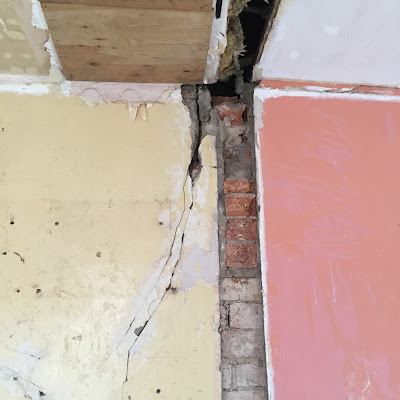 to provide the steel calculations (which you can read about here) and prior to the walls coming down, we removed the kitchen, the skirting and architrave, as well as moving any electrics that currently resided on the walls. We also covered up our new french doors, dexter style. The building work happened over two days, with the first wall to come down being the internal dividing wall between the kitchen and old shower room. We had intended on doing this work ourselves, but when we realised it was providing a small amount of support to the roof, we decided to leave it to the builders. Turns out, this really was for the best. In the words of our builder, "This wall was built well". The mortar seemed like glue and it was not releasing any bricks without a fight! In fact, very few bricks separated and most of the wall had to come down in sizeable chunks! To make matters worse, you remember that crack on the single-skin party wall between us and the neighbour? Well, that caused another little issue when our neighbour came knocking to tell us a crack had now appeared on their wall. I was completely mortified, went into slight panic mode and probably blurted out all the wrong things about how the previous owner of their house had tie-bars put in, and how we had a massive crack on our side and generally giving zero comfort and making matters somewhat worse. In hindsight, I should have kept my gob shut, apologised and sent the builder round to calmly tell them what the problem had been. After seeing their crack, it certainly wasn't anywhere near as bad as I had envisioned, which was the whole wall being steps away from collapse and it wasn't even in the location of the crack on our side - it was exactly where the dividing wall had been removed and it was actually quite small too. Our builder said it was just a hairline crack, caused from minor movement in separating the tied-in brickwork. He was brilliant and fixed everything up on their side and re-assured them about everything too. If you're wondering how things between us and the neighbours are - absolutely fine! We took round some flowers and chocolates as a token of an apology and invited them round to see the crack on our side for themselves so it would put their minds to rest. They were unbelievably okay about the whole thing and even told us about a similar thing that had happened on a property they had owned! After living next to nightmare neighbours at our first home, it was a real unexpected and pleasant surprise at how just nice they were about the entire thing. We discussed the crack with them (something we probably should have done before!) and they agreed it was best to leave well alone, particularly after we discovered that their basement actually runs underneath the kitchen on their side too - meaning the foundations of this dodgy wall go far further down than we had imagined. In fact, it also make us question whether or not we once had a room underneath our kitchen too! Our builder also installed a new roof support, which was basically just a wooden strut inside the ceiling, which replaces the brickwork that was 'propping' up the purlin. This was pretty hard to photograph, but you can slightly see the bottom of a beam in the gap in the ceiling in the photo above. The new strut is fixed onto this and then fixed onto the purlin as well. It's exactly the same as what our neighbours have on their side of the roof. After the first wall was down, the builders then began fitting the acrowprops ready for removing the load bearing wall the next day. By the way, the mess was crazy! 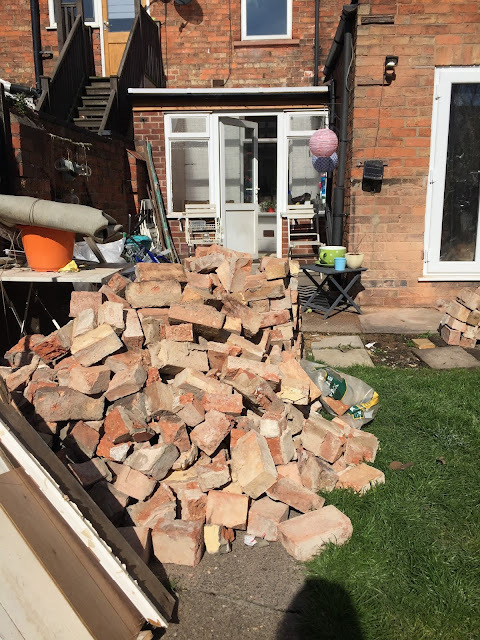 We had told the builder we didn't require a skip and would dispose of the bricks ourselves... Turns out, walls look much smaller when they're up and not down! The next day, the cupboard was the first thing to be removed. It also bought about a new issue when we realised the brickwork suddenly changed from two-bricks thick, to just one-brick thick, left of the kitchen doorway. The steel we're using was designed to sit onto a two-brick thick pillar so this meant building up a new pillar against the original brickwork. The rest of the wall was then removed, which by the way was ridiculously dusty (seriously, it covered the entire house!) and had smoke alarms going off all over the place. But it was so worth it, leaving a enormous and very scary hole, bearing in mind the steel wasn't yet in pace. It was a pretty anxious wait to say the very least, but the space and impact of having this wall down was completely shocking and a very dramatic change! It looks so very different! It actually felt a little like a garage stuck on the back of the house. The room is much longer and wider than I had envisioned and we also realised this room was quite obviously angled, which we had never noticed before. The amount of light now that shines through into the dining room has greatly improved, the kitchen no longer feels like a box room without any external windows and I think this space works MUCH better than it did before. In fact, it makes me ridiculously excited about the rest of the renovations ahead! Can you believe we waited so long?! A few downsides to this project was the dust - it went everywhere. And the pile of rubble and bricks we were left with. In hindsight, a skip was most definitely required, however surprisingly, I did manage to get rid of more than half the bricks via eBay! And as for the giant pile of rubble, we hired a van and several trips and bucket loads later, that was gone too! We spent a total of £30 on the van, £10 on petrol and £23 on some giant buckets, which was ridiculously cheaper than a skip - just not so great on the back! Despite the dust and back breaking clear up mission, this job was so unbelievably worth it! It's a big change to the layout, but it makes much more sense now and the kitchen is now the right proportion to the rest of the house. Not to mention that it finally has a connection to the outdoors, which I am really grateful for! We paid £1040 to our builder for the removal of both walls - this cost also included the steel and roof support and for such a huge job over two days I think it was a really reasonable price to pay! They were really great throughout the two days and I'm chuffed to bits that it's finally done and dusted and we can finally move forward in our kitchen renovation! The builders we used were R J Boyles and if you're in the Nottinghamshire area, I would definitely recommend them!